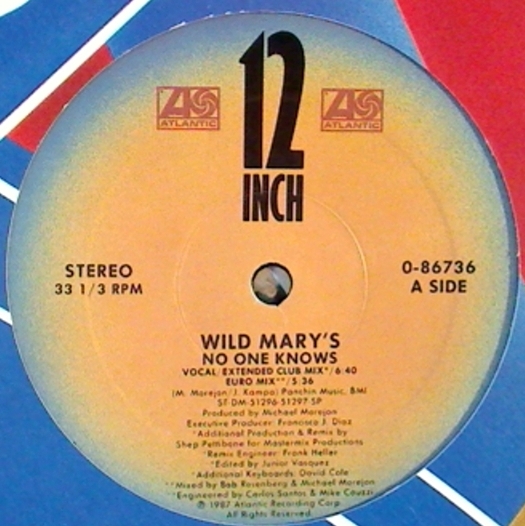 “No One Knows” by Wild Mary began it’s life as 12″ single on Pantera Records in 1986 titled “No One Knows Where She Goes” by Mary’s Wild, it bacame an underground Miami hit and was picked up by Atlantic Records where the band’s name was altered, the track name shortened and given some hot Shep Pettibone remixes. The track was co-written and produced by Michael Morejon who had a hand in writing a number of late 80’s Miami Freestyle hits for Olga, Laurie Miller and Sequal. In the 90’s, he would go on to work with Jon Secada and Gloria Estefan.